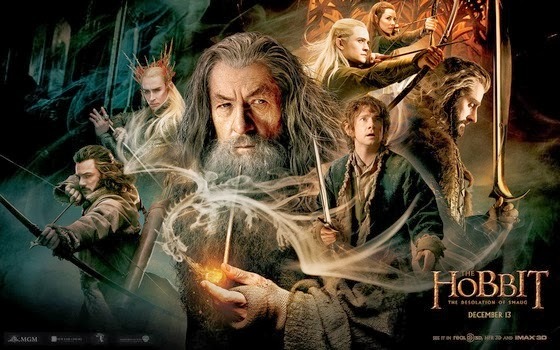 An altogether more engrossing affair than the charming, but plodding, first film, this second of director Peter Jackson's Hobbit trilogy feels shorter than its 2 hour and 40 minute running time, due largely to more assured storytelling and better pacing. There's still narrative padding that could be trimmed if not for artistic overindulgence, but as a whole the film doesn't outstay its welcome, with some truly nail-biting action sequences and a host of interesting characters, both old and new. 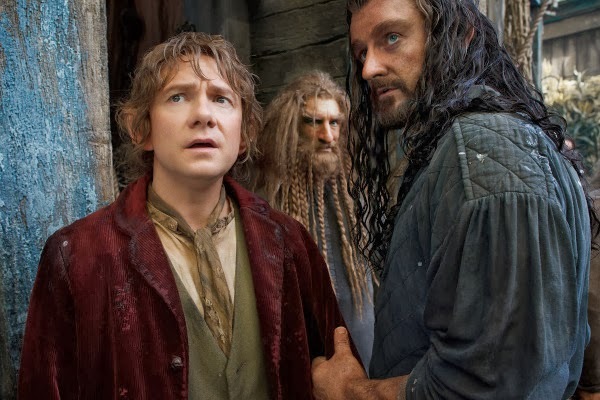 Once-hesitant, now emboldened hobbit Bilbo Baggins continues to aid a company of dwarves in their quest to reclaim their homeland from a vicious dragon (the titular Smaug), encountering a shapeshifting bear-man, malicious giant spiders (in the film's most terrifying sequence), bloodthirsty orcs, and much more along the way. Martin Freeman, as Bilbo, does fine work as the series' anchor; once again he deftly balances humility, humanity, and humor. Ian McKellen totally inhabits the character of Gandalf, whose parallel quest here provides some very satisfying connective tissue between this trilogy and that of The Lord of the Rings. Richard Armitage continues to impress as the dwarf king Thorin, investing the character with complexity and a real edge. Ken Stott, as the warm and paternal Borin, also makes a lasting impression. Orlando Bloom slips effortlessly back into the role of Legolas. It's good to have him back, even if he remains a rather static character here. Since his major arc (overcoming prejudice and befriending a dwarf) occurs in the other trilogy, he's not given much to do in this outing except athletic heroics. Fortunately, it's not overkill (pardon the pun). 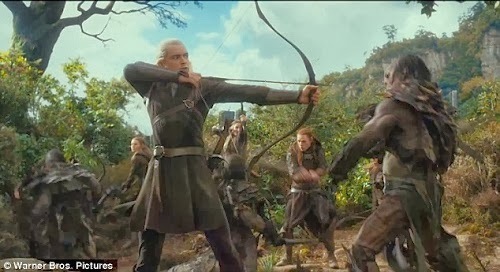 On paper, Legolas' return and acrobatic kills seem to be shameless fanboy pandering; onscreen, however, they really work due to the creative enthusiasm which both actor and director bring to the… ahem…execution. Several new characters energize the franchise here. 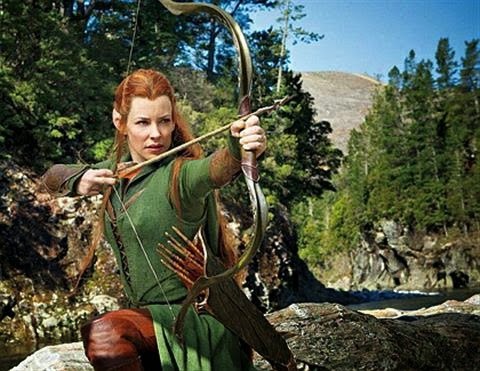 Lost‘s Evangeline Lily provides Middle Earth's answer to Katniss Everdeen, bringing ferocity to her action scenes and tenderness to the psuedo love-triangle between herself, Legolas, and roguish dwarf Kili. I had worried that this romantic subplot, not found in the novel, would feel tacked-on and bog everything down with melodramatic soap opera. While there were a couple of moments that nearly got my eyes rolling, I must say that it's all handled with enough restraint that it never hinders the story (it even adds to it at times). Plus the actors do a great job of selling it. Luke Evans, as Bard the Bowman, fares far better here than he did as the cartoonish villain in Fast and the Furious 6. 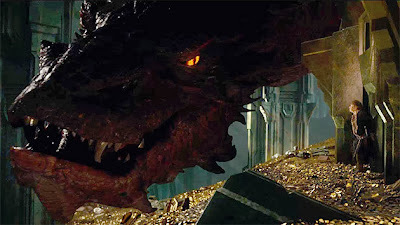 The film's greatest asset, however, is its titular dragon, a stunning blend of computer animation and motion capture performance by the inestimable Benedict Cumberbatch (Khan in this year's Star Trek Into Darkness). The character oozes with menace, charm, danger, and fierce intelligence, doing full cinematic justice to Tolkien's literary creation. Smaug is a villain for the ages. As always, Weta Digital's visual effects are without equal, Howard Shore's score is marvelous, and the production design (from the glorious sets to the wardrobe and makeup) allow audiences to truly lose themselves in Middle Earth. Peter Jackson and company have got their groove back. Bring on Part Three. 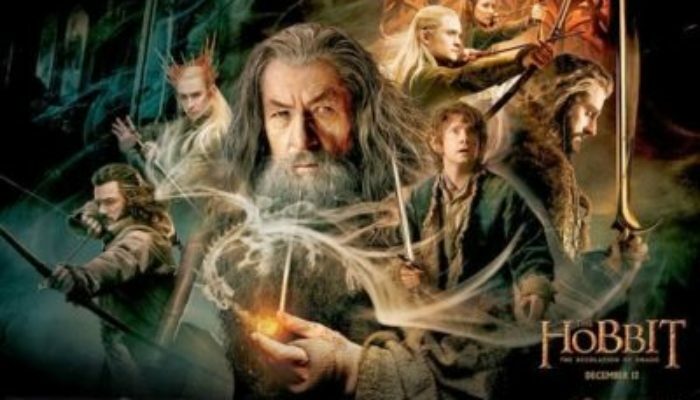 CONTENT OVERVIEW: The Hobbit- The Desolation of Smaug is rated PG-13. There is no foul language, but there is one mild innuendo. The rating is primarily for violence and a few frightening scenes. As with the Lord of the Rings films, there are numerous battles with orcs and monsters which display stabbings, beheadings, shootings by arrow, and the like. 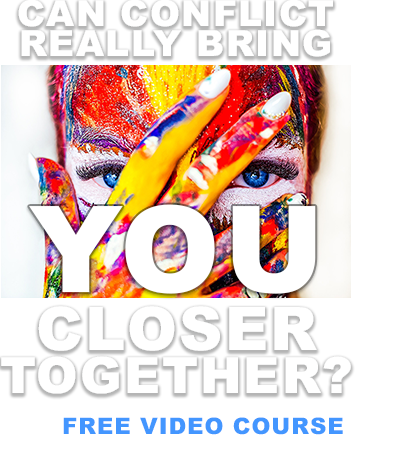 MESSAGES TO DISCUSS: The quest for power often leads to corruption, a point Jesus made when he asked: “What is a man profited, if he shall gain the whole world and lose his soul?” (Matthew 16:26). Bilbo's diligent refusal to give up echoes the attitude of Nephi who, when the brass plates seemed impossible to acquire, told his brothers that “we will not go down to our father in the wilderness until we have accomplished the thing which the Lord hath commanded us” (1 Nephi 3:15). Similarly, we can accomplish great things if we exercise our faith by refusing to give up when things seem difficult or even impossible.